The Darkening Nation: Race, Neoliberalism and Crisis in Argentina, published by University of Wales Press in May 2018, is a monograph by CLACS member Ignacio Aguiló. In this post, he briefly tells us about the contents of the book and its relevance within and outside Latin American Studies. At the turn of the twentieth century, and after a decade of drastic neoliberal reforms, Argentina experienced the worst economic crisis in its history. At the time, half of the population was living in poverty, the unemployment rate was 25% and job precarity was widespread. In December 2001, the freezing of bank savings was met with social unrest which led to the fall of the government. Subsequently, the country declared a default on its public debt – the largest in history at the time. While there has been a large body of scholarship examining the economic and political implications of this crisis, few have analysed its cultural dimension. The Darkening Nation aims to fill this lacuna by reading the crisis across cultural productions such as novels, films, artworks and songs produced during this period of national emergency and showing how the country’s economic collapse was experienced by sectors of the population as a crisis of national and racial identity. During the 20th century, dominant templates constructed the nation of Argentina as a sort of regional exception: a white Europeanised country in Latin America. This exceptional whiteness was, allegedly, the result of both massive European immigration and the extinction of pre-existing indigenous, black and mixed-race people at the turn of the twenty century. Although in reality non-white groups did not wither away but were instead invisibilised through a complex series of cultural and social strategies, the idea of a ‘white Argentina’ became a powerful articulator of nationness, both internally and abroad. Mexican poet Octavio Paz summarised this by stating that, ‘[t]he Mexicans come from the Aztecs, the Peruvians from the Incas, and the Argentinians from the boats’. Through the analysis of cultural expressions, The Darkening Nation demonstrates that the 2001/2 financial meltdown was experienced by those sectors of society that had embraced and sustained the notion of ‘white Argentina’ as a traumatic process of national ‘Latin Americanisation’ and ‘darkening’. In so doing, it exposes and problematises the often overlooked link between economic crisis, national identity and race, in Argentina. The feeling of national blackening also led to a rise of racism, which was particularly targeted at immigrants: Peruvians, Bolivians and Paraguayans were blamed for the economic decline of Argentina and portrayed as ‘contaminating’ the country’s historical whiteness. In this sense, The Darkening Nation shows how many processes currently affecting the Western world in the aftermath of the 2008 global financial meltdown had already taken place in Argentina at the beginning of this century. In both contexts, reactions against impoverishment and precarisation were expressed through the embracement of anti-immigrant and nativist sentiments, and a call to return to an idealised national past of cultural and racial homogeneity. The election of Trump and the Brexit vote are seen as paradigmatic examples in Anglo-Europe of conservative responses to the failures of neoliberalism. Lastly, The Darkening Nation charts the ways in which, during the Argentinian crisis, certain cultural producers challenged dominant narratives of whiteness and their exclusionary nature. They exposed that, rather than extinct, indigenous, black and mixed-race populations had been systematically expelled symbolically from the nation throughout the twenty century. By looking at how culture became a platform for the critique of restrictive ideas of national belonging and racism during the country’s economic collapse, this book contributes to the study of the usually sidelined yet enormously influential cultural dimensions of the crisis. Yet the book’s impact goes beyond Argentina and Latin America; it explicates how the current pressing issues in the United States and Europe were navigated years ago by Argentinian society. As such, The Darkening Nation can also cast light on strategies to respond to the growth of racism manifested as a reaction against the negative socioeconomic impact of neoliberalism. As part of the seminar series organised by the Centre for Latin American & Caribbean Studies at the University of Manchester, on 7 February 2018, Dr Gustavo Carvajal Lazcano (Universidad Finis Terrae, Chile) gave a talk on indigenous people in recent Chilean cinema, focusing on Patricio Guzmán’s El botón de nácar (The Pearl Button, 2015). Dr Carvajal’s paper challenged widespread readings of the film as an appreciation of Patagonian Amerindians, arguing instead that it reproduces established representations of indigeneity as racial Others. Here you can listen to the full audio of the talk and the discussion that followed. Audio of the talk given by Valentino Gianuzzi (Manchester) for CLACS’s seminar series, entitled ‘Before Amauta: The Early Peruvian Avant-Gardes and the Fear of Modernity (1916-1926)’. 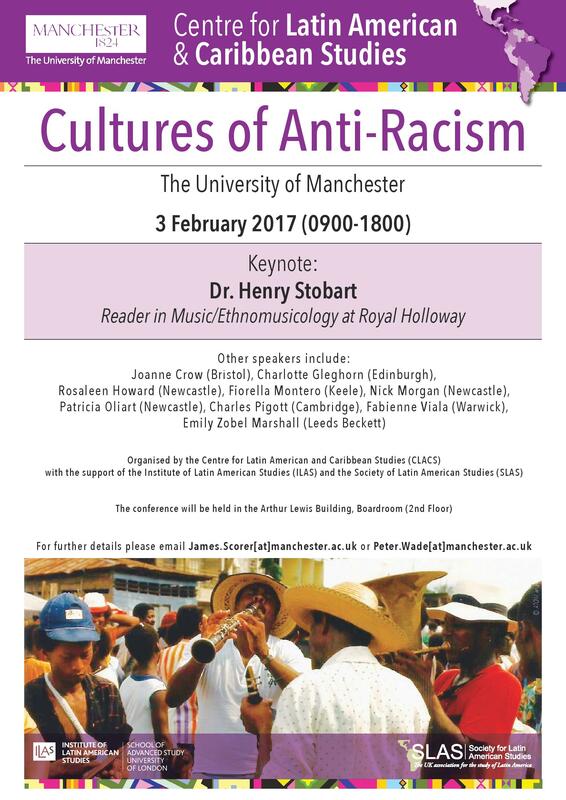 Our forthcoming conference on cultures of anti-racism in Latin America.